For accurate and reliable measurements, use the Winco MSP-4P 4-Piece Stainless Steel Measuring Spoon Set. This stainless steel measuring spoon set features measurements of 1 tablespoon, 1 teaspoon, 1/2 teaspoon and 1/4 teaspoon with the measurement amounts engraved on the spoon so they won't wear off with use. 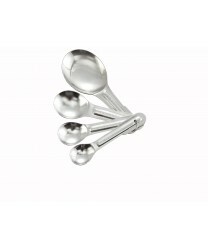 These spoons can be filled easily with any ingredient or spice so you can add all your measured ingredients with ease. They are attached together with a stainless steel ring so they won't get lost or misplaced.